THE CALLING has been receiving rave reviews from the international media, with the US’ Guitar Player declaring, “It’s a thrilling, edgy, ballsy, inspiring, and beautiful work that sounds as purposely constructed as a symphony piece. Less-blessed composers and guitarists can now take a moment to cry…” and Vintage Guitar avowing, “THE CALLING, has some of his most vibrant playing to date…epic textures and some of the most stellar guitar tones Schon has ever recorded.” The UK’s Classic Rock proclaimed, “…a musical masterclass,” while Guitarist stated, “stratospheric playing!” Neal Schon graces the cover of the February issue of the US’ Goldmine, on stands now. In other news, PRS Guitars recently announced the introduction of two new Neal Schon signature models, NS-14 and NS-15. Schon was intimately involved in the design of nearly every aspect of the instruments. For more information, please click here. Schon just appeared at the NAMM trade show in Anaheim, CA to personally introduce the new guitars. 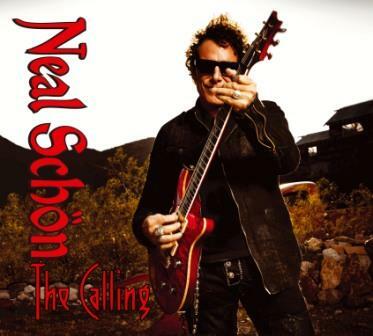 Neal Schon’s THE CALLING is produced by, and features, Neal Schon on all guitars and bass, and reunites Schon with former Journey bandmate, Steve Smith, who lends his virtuoso drum talents to all 12 tracks on the new album. In addition, Grammy® Award-winning special guest Jan Hammer (Jeff Beck, Mahavishnu Orchestra,) recorded Moog synthesizer solos on two tracks - “Fifty Six (56)” and “Tumbleweeds” and Igor Len, an accomplished classical, jazz and film composer who has previously collaborated with Schon, is featured on acoustic piano throughout the album. Recorded at Berkeley’s famed Fantasy Studios during a break from Journey’s busy touring schedule, Neal completed the album from start to finish in just four days. Journey, one of the most popular American rock bands of all time, of which Neal Schon is a founding member, has earned 19 Top 40 singles and 25 gold and platinum albums, was awarded the prestigious “Legend Of Live Award” at the 2011 Billboard Touring Awards, and received a star on the Hollywood Walk of Fame. As the only member to record on all of Journey’s albums, Schon continues to lead the band today in its latest incarnation. Schon will be on a world tour with Journey in 2013.